Step 1: Remove the tire, tube, rim tape and rim lock from the rim you intend to assemble T-Lock Concept on. Step 3: Talk the tube plentiful. Fill a small amount of air in the tube. Assemble T-Lock and tube with the plastic ties as a single unit. Lubricate T-Lock sides with T-Lock seal (See picture B). Nut must stay at the tube valve inside the rim, do not remove it. Assemble the T-Lock like an ordinary tire. (See picture C). Remove the plastic ties. Inflate the tube slightly with a few pumps and centre the T-Lock round the rim trench. Important! Deflate the T-Lock tube before assembly of the tire. 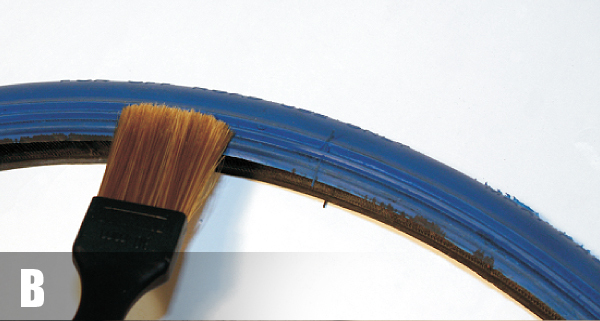 Step 4: Place the MX tire at the floor, apply some T-Lock Seal at the inside of the tire and the tire edge with a brush. (See picture D). Push the rim downwards between the tire edges. Press one side of the tire over the edge of the rim. So the rim is placed between the tire edges in the bottom of the tire. (See picture E). Step 5: Lay down the wheel (on a tire stand if possible) Start to press one of the tire sides over the rim edge. Be careful with the tire levers so you not will damage the T-Lock’s sealing lips. Turn the wheel around and start to assemble the other side. 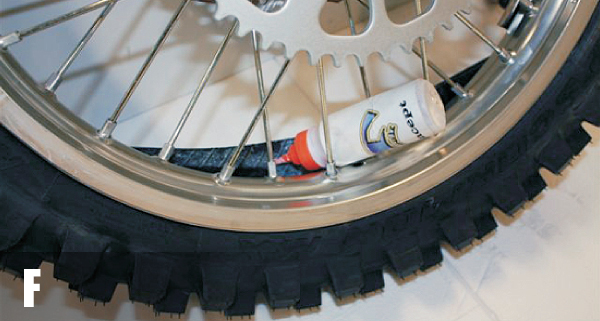 Before you complete the assembly of the tire, turn the wheel upright and fill it with T-Lock Seal, 200 ml (See picture F). Step 6: Inflate the tube until the tire edges pops outwards to the rim edges. Some tires need assistance to pop out. Hit the side of the tire carefully with a hammer or similar tool until the tire pops out. Release the air of the tube and inflate it again with the final pressure of 100 psi (7 bar). This step will make the T-Lock find it’s correct position inside the tire. Put the valve cap on. Step 7: Assemble the needle-valve. Insert the needle in the tire, between the knobs. (See picture G). Pressurize tire to desired pressure. Minimum 7 psi, 0,5 bar. Pull out the needle-valve and rotate the wheel so the hole from the needle is turned downwards to the floor. This will make the fluid inside the tire seal the needle hole from the inside. Wait a few seconds and then check for air leaks where you had the needle inserted. Pop out: If the tire doesn’t pop out on the rim, inflate the tire until it does. 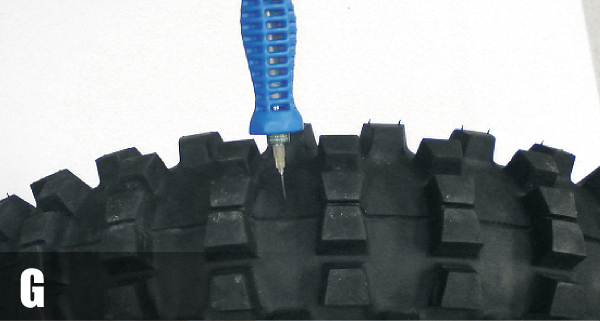 See step 6 to learn how to inflate the tire. Adjusting tire pressure: If you want to adjust or control the air pressure, just put the needle in the same area as before and follow the instructions in step 7. Observe that manual pressurizing is slow through the needle, since it’s rather thin. The tire pressure shall be minimum 7 psi (0,5 bar) or higher as preferred. 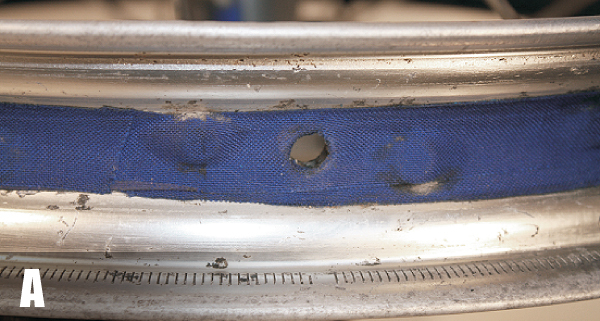 Pressures under 7 psi (0,5 bar) causes excessive wear on the tire walls. Air pressure varies with temperature changes. Checking T-Lock pressure: Always check the high pressure in the T-Lock tube before every day you ride. The pressure shall always be at least 100 psi (7 bar). Preferably use a pump with a pressure gauge so you can measure the pressure at the same time. 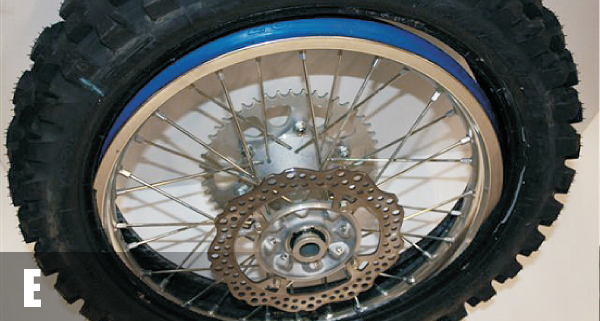 Changing tires: Lay down the wheel (on a tire stand if possible), release the pressure from the T-Lock tube. Squeeze the tire away from the rim edge and start to dismantle the tire side from the rim. Turn the wheel around and dismantle the other side from the rim. The rim shall now be between the tire edges. Turn the wheel upright and push the rim downwards into the bottom of the tire. Grab a hold of the upper part of the rim with one hand and put the other hand of the upper part of the tire and force them apart sideways. 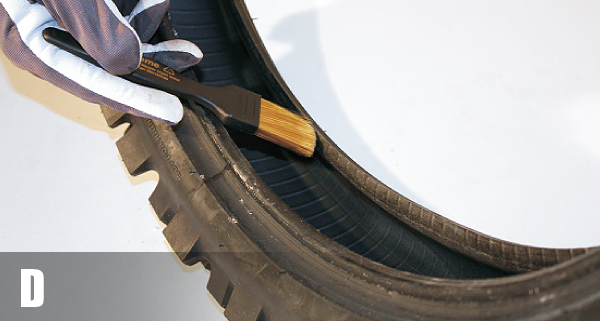 Leave the T-Lock on the rim, now you can assemble a new tire as described from step 5. Adjusting the spokes: Always release the pressure of the T-Lock tube before you adjust the spokes. 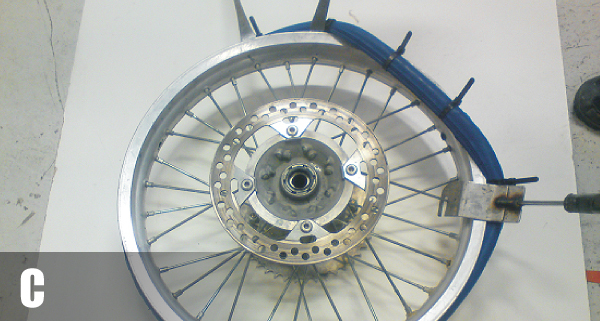 Otherwise the rim tape and the tube might be punctured by the spoke nuts because of the high pressure in the tube.